Kicking out the jams from Munster Germany since 2002 is Eat The Gun, delivering their fourth long player Stripped to the Bone, now signed to SPV/Steamhammer Records. The title of the album has some meaning for the band. From song writing to recording the band took a minimalist, stripped down, approach. Eat The Gun: up against the wall. Principal songwriter Hendrik Wippermann composed the songs on acoustic guitar putting emphasis on both melody and lyrics. He backed down to one guitar and one amp when recording in the band's studio (for financial reasons). Surprisingly or not, Stripped to the Bone sounds equally polished and raw, frenetic but crisp and clear as well. Having gone electric, the guitar-driven tunes light up the album, but Eat The Gun's bare bones at the start approach lifted the bass line and amped up the drums as well. The result is some more of the bands catchy, tight, melodic heavy rock splashed with an alternative vibe that might have some listeners hearing early Foo Fighters. A few highlights. There deep rock groove to Addiction, Won't Let You Down, and Bad Memories; something more speedy with Made of Stone and Wake Me Up (which early on has ZZ Top feel in the riffs); the subtle blues and sharp guitar of Apocalyptic Blues; and, the straight in-your-face rock of Lone, with more of Wippermann's crisp fret work. 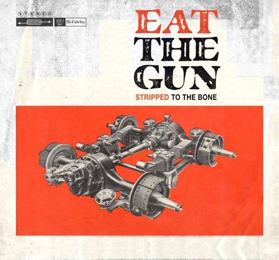 Stripped to the Bone keeps Eat The Gun on the track to being one Europe's best pure melodic heavy rock bands. Recommended.